I was born in 1928 at the Corner House, French Horn Lane so the first thing I can remember was walking down the Union Lane, now Wellfield Road, to visit my grandparents who lived in Stockbridge Road. St Albans Road was all small shops and most people knew everyone else, As I grew I would be sent to one or other of the shops with a list of goods and the money, gradually the shop owners became friends who watched the children grow up, forming lifelong friendships. Life centred mainly round the Parish Church, most families attending once or twice on a Sunday. I well remember the church being completely full, with chairs being put down the aisle to accommodate everyone. This was usually on special services. Other organisations were the British Legion, Girl Guides and Brownies, Cubs and Scouts. With the friendship of these we always felt safe walking to school on our own at quite an early age. I used to walk along behind the St Albans Road shops to Dellfield School passing Lusty’s sweet shop and along between the allotments. No school meals in those days most of us went home for dinner which was from 12 o clock to 2 o clock. School hours were from 9 o clock – 12 o clock and from 2 o clock to 4 o clock. St. Audrey’s School closed at 4.30pm. Looking back we were well taught beginning to read at 5 years old, progressing with reading cards to easy books. Friday afternoons we were able to take a toy to play with. We each had a box in which we kept pencils, reading cards etc. these were collected after lessons finished each day and kept in a cupboard. Each child was given a pint of milk each day. I still have my school photographs. St Audrey’s was a church school and we had scripture lessons every morning and each year we had an examination, this took up a morning and we had to answer questions usually by a Dean from St Albans Abbey. We were then given the afternoon off. Along St Albans Road between the shops and houses were Rights of Ways which went through to the Common some had cottages and small shops. The Reading Room has been there as long as I can remember, we used to go there to do dancing classes and Kings Messengers run by Miss M. Ellingham. I am amazed it is still standing. Most of the shops dealt in one type of goods, not as today’s supermarkets which sell almost everything under the roof. I believe it was agreed between shop-keepers that this was how they would operate. We could buy most things needed in the village. There was Tingey’s furniture and ironmongery shops which sold china, bicycles, tools, lawn mowers, fireworks, paraffin etc. A shoe shop, newsagent, sweetshop and hairdresser, greengrocer and post office, fish shop, electricity show room, chemist, hats, haberdashers, and Tingey’s grocery store. On the other side of St. Albans Rd. there was a bakers, a ladies hairdressers and a newsagent. Further along the St. Albans Road was the bus garage, Police Station, Council Offices and another row of small shops. Along the Gt. North Road in Old Hatfield, there were another row of shops, Gentlemen’s outfitters, sweet shop, photographer, dairy shop, green grocer, and Barclays Bank and Westminster Bank, butchers’ and the International Stores, Moving along to Fore St. And Park St. Was a ladies outfitters selling hats and materials, a gentlemen’s outfitters, haberdashers and the one I remember the most was Dr Cox’s little shop which had large coloured bottles in the window, going two steps into this dark little shop was like an Aladdin’s cave. My Grandfather used to take me there on Friday mornings to collect a copy of the Sunday Companion. Dr. Cox sold all manner of items, costume jewellery, walking sticks, rubber balls and medical items. My association with Dr. Cox continued into my teens when he used to save me a comb when these were difficult to get during the war years. I have a painting of Hatfield church painted by James Cox in 1852; I often wonder does anyone else have one? Hatfield Park was open to everyone and we used to walk there and picnic with our friends. The Agricultural Show was held there and was a great attraction. The gardens were open on Thursday afternoons which was early closing day when the shops closed at 1 o clock; they always opened on Saturday afternoons. In the winter skating was allowed on the lake. This part of old Hatfield remains much the same except for the addition of new houses and small shops turned into living accommodation. Hollier’s Dairy was situated in French Horn Lane, where you could go to buy milk and a jug of cream for 6d. The cows were kept in a field at the back of the dairy adjacent to St. Albans Rd. until part of the field was used for the Memorial Hall built in the late 1930’s It was there that I saw my first TV set. Milk was delivered by horse and cart, as was fish; coal came loose on an open cart and was wheeled round to the coal-house by wheelbarrow. Groceries were also delivered, a man would come write down the order in the morning and they would be delivered in the afternoon by tradesmen’s cycle. Refuse was also collected by horse and cart, the depot was situated near the railway bridge in Wellfield Rd. Shire horses were used then. Where New Hatfield is built was all lanes and fields, mushrooms and wild flowers grew in abundance and around Downs Farm we used to pick blackberries. The bowls club and tennis club was behind Kennelwood House and there were allotments further along French Horn Lane and Glebeland. In Batterdale there was a convent and fire station which was manned by volunteers. The Girls School, London Road became the “Munch factory” they produced a form of “Flap Jack” and you could go there and buy a 3d. Bag of pieces, they were delicious. Travel was by train or bus, the bus service to St. Albans and Welwyn Garden City were good and there was also the Green Line bus which went into London and Birches coach which went to Bedford. Street lights were gas lamps and I remember the lamp lighter coming round with a long pole to pull the chain to light the lamps, I think they were extinguished ant midnight. Electricity was a luxury and many homes were lit by gas of oil lamps. Houses were heated with a combination of coal fires or wood, ranges were used for cooking which combined an open fire with a double oven at the side and a tank behind the fire to heat the water. Not many homes had central heating. 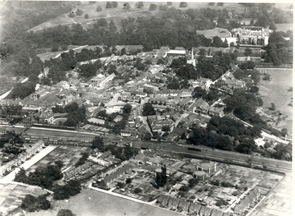 With the coming of the 2nd World War the face of Hatfield changed. Windows were covered in black-out curtains and street lights were extinguished. Precautions began to be taken i.e. Shelters were dug in gardens and at school, ARP wardens came into being and the Home Guard were formed. We all walked about with torches after dark only to be pointed at the ground. The Parish Church was also in darkness except for a large lighted star which hang over the chancel steps. The bells were moved from the belfry in order to preserve them; just one remained to be rung in the event of invasion. Hatfield House became a military hospital and Bush Hall a convalescent Home for soldiers. Schools to be shared with evacuees from London and for a few months St, Audrey’s pupils had lessons in the morning and the evacuees had the school in the afternoons. We also had sewing classes in the Congregational Hall once a week. During the first months of the War much of our time was spent in shelters as Hatfield received the same warnings as London. Convoys of military vehicles used to pass along the St. Albans Rd. and quite often were held up and we would make them a jug of tea which they were always pleased to receive. Food and clothe rationing were gradually brought in and I remember working as a volunteer at the food offices during school holidays mainly stamping ration books. Gardens were dug up in order to grow fruit and vegetables. Neighbours and friends shared spare produce and helped each other in many ways. As the young men were called into the Armed Forces, women began to take up the jobs and older men came out of retirement. Evenings were spent knitting for ourselves and the Forces. We used to collect wool from Rose Cottage, which was situated along one of the ~Rights of Ways to make scarves, gloves, mittens, socks and oiled wool for sea boot stockings for the Armed Forces. “Make do and mend” was a well known phrase which we all practiced. There was some damage from bombs, V1 and V2 missiles and shop windows were gradually boarded up. When VE day arrived a large bonfire was lit in the park and a parade passed through the village. Slowly life returned to something like normal. There was sadness too for those who did not return and joy for those who did. Housing was difficult to get and families had to live together. Once new Hatfield began to develop life began to be easier. In 1951 after our marriage we lived in two rooms over Tingey’s Ironmongery until we were able to buy a house in 1953 in St Albans. I had contact with Hatfield until 2009 when the last of my family there passed away. This page was added on 04/01/2013.